Benson Henderson and Jorge Masvidal will battle this Saturday (Nov. 28, 2015) at UFC Fight Night 79 inside Olympic Gymnastics Arena in Seoul, South Korea. In a match up of well-rounded warriors, what adjustments must be made for either man to claim victory? Find out below! 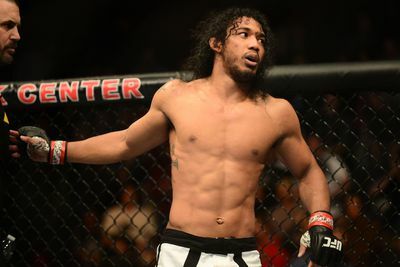 Ultimate Fighting Championship (UFC) welterweight standouts Benson Henderson and Jorge Masvidal will clash this Saturday (Nov. 28, 2015) at UFC Fight Night 79 inside Olympic Gymnastics Arena in Seoul, South Korea. After a pair of tough losses at lightweight, Henderson jumped up a weight class on short-notice opposite Brandon Thatch, who had a great deal of momentum behind him at the time. Henderson looked great in that fight, and he’ll look to build from that win here. Similarly, a controversial decision loss sent Masvidal to welterweight. He’s had just one fight as well, which he finished with a sudden knockout. As a longtime veteran of the sport who’s fought pretty much every where, Masvidal is hoping this change will propel him to the title. Let’s take a look at the keys to victory in this bout.